(autoinsidernews) - Audi's new A5 coupe was caught in camera during high speed testing in heavy rain at the NГјrburgring. While we have seen mules and prototypes of the A5 before, these are the first shots that really show the car's final shape. Expected to be available in coupe and convertible variants, the A5 is heavily inspired by the Nuvolari concept show in 2003. 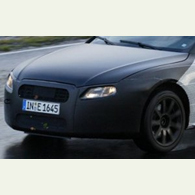 The Audi A5 prototype caught in these images still has a fake front fascia, but based on all recent Audi's it is easy to imagine Audi's single frame grille behind the facade. The Audi A5 appears to be significantly larger then the current A4, in fact, nearly the size of the A6, which gives the car a unique segment, larger than the BMW 3-series, and Mercedes CLK, and neither the BMW 5-series, Mercedes E Class offer coupes or convertibles, reports Trend. Expect the A5 to come with typical Audi hardware, including quattro all-wheel drive, DSG and six-speed manual transmissions, a 3.2L FSI V6 and likely the 4.2L FSI V8.